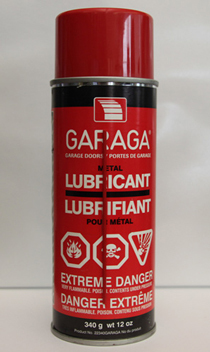 Rollers, hinges, and all moving hardware should be lubricated with a metal lubricant (available from your Garaga dealer). For the tracks, you can also use a metal lubricant, mainly where the tracks curve. The same goes for the springs. Apply a metal lubricant and wipe off the excess with a cloth, thus lengthening the lifespan of your springs. Never put grease on the tracks. Remember that rollers must “roll” and not slide in the tracks.